Over the last few days I’ve been exploring how to create custom brushes for the excellent Procreate on my iPad. To make 3D clothing textures look more realistic we needed some stitch brushes. Plenty are available for Photoshop, but scouring the internet I couldn’t find any for Procreate. 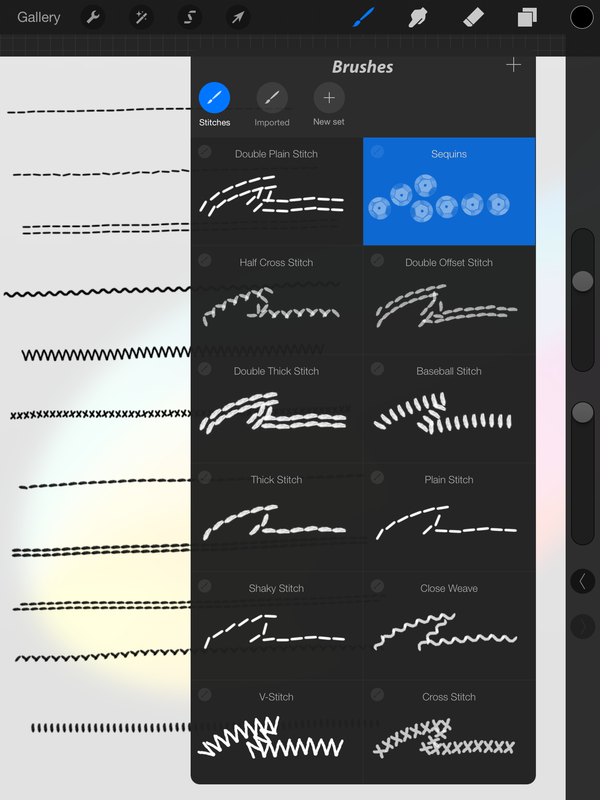 Here’s my first attempt at some custom brushes, as explained in the Procreate Manual (you can get it for free on the iBookstore). You can amend the brushes to your liking by tapping on them. Perhaps swipe left and duplicate them first, just in case. if you like you can apply some randomness to the stitches by adding Jitter (under Stroke). None of these brushes are pressure sensitive as this would not be a desirable effect for what I’m doing, but if you need this feature then explore the Dynamics menu. And don’t forget to read the Procreate Manual for more info! The brushes work on both Procreate for iPad, and Procreate Pocket for iPhone/iPod Touch. Huzzah! Just what I was looking for, thank you , thank you, thank you, so glad to have these brushes! These are brilliant; thank you!